The Shipley baseball team beat Princeton Day on Friday. Ethan Kline's RBI single in the eighth gave the Shipley baseball team a 5-4 win over Princeton Day on Friday. Liam Riley drove in two runs for the Gators, who improved to 19-3 on the season. 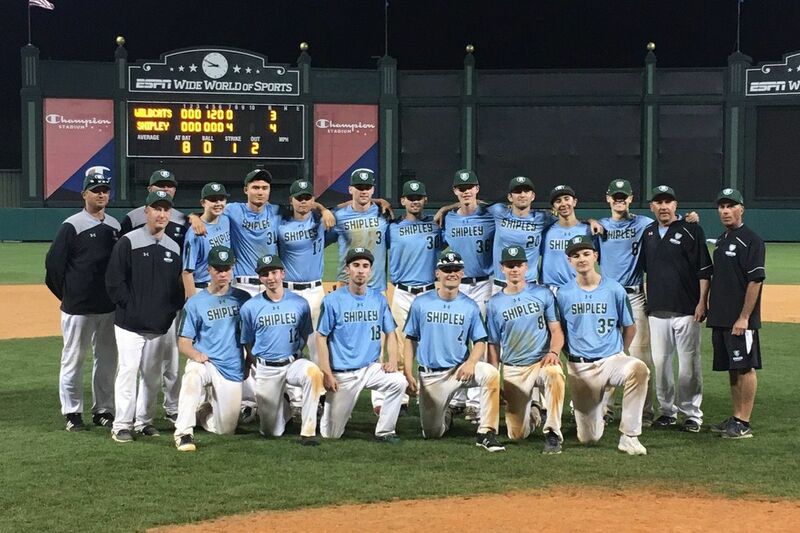 Shipley bounced back from Wednesday's 5-2 loss to Malvern Prep. Billy Corcoran struck out nine over five innings as Malvern Prep beat Germantown Academy, 12-1. Will Park hit a two-run homer and Jack O'Reilly tossed six scoreless innings in Episcopal Academy's 2-0 triumph over Haverford School. Conor Smith had two triples and four RBIs as Methacton rolled past Pottsgrove, 11-1. The win puts the Warriors at 14-3 on the season. Alex Podagrosi drove in five runs as GAMP rolled past Mastbaum, 16-5. Bryant Baez pitched a perfect game as Olney shutout Masterman, 14-0. Kenneth Brough homered as Lincoln cruised past Science Leadership, 18-4. Aidan Crean went 4-for-4 with two RBIs. Church Farm held off Collegium Charter, 11-9, thanks to freshman Reggie Phifer's all-around performance. He got the win on the mound and helped himself out at the plate with a triple and two RBIs. Olivia Kunitsky's key hit in the bottom of the seventh gave Avon Grove a 6-4 win over Oxford. With the bases loaded and the score tied 4-4, Kunitsky doubled to bring in the winning runs. She finished with three hits in the game. Ceire Devlin-Mohan had 10 strikeouts in Marple Newtown's 12-3 victory over Penn Wood. Grace Thorne knocked in two runs. Jayme Rubenstein's two-run single in the fourth proved to be the game-winner in Upper Dublin's 3-2 triumph over Upper Moreland. Big defensive plays by a number of Upper Dublin fielders helped to strand a total of nine Upper Moreland runners. Caitlyn Mihalik shined in the pitching circle and at the plate in George School's 16-8 decision over Germantown Friends. Mihalik tossed a complete game and went 3-for-5 with four RBIs. The Cougars improved to 11-1 overall and 9-0 in Friends Schools League action. Dewi Henry's all-around effort helped Westtown defeat Abington Friends, 11-4. Henry struck out 13 and helped herself out at the plate with a three-run homer. Celia Meyer scored 10 goals as Germantown Friends blanked Friends' Central, 18-0. Peyton Mottice's five goals propelled Downingtown West past Interboro, 18-3. Tabitha Rodriquez added four goals. Ellie Mueller and Cate Cox had three goals apiece as Radnor held off Abington. Danny Payne netted five goals in North Penn's 12-9 win over Council Rock South. Michael Samson, Erik Ojert, and Joey Rockovich each scored three goals as Central Bucks West handled Council Rock North, 17-8. Central Bucks East took down Pennsbury, 12-1, thanks to five goals from Michael Ott.